Good day everyone! Today I bring to you my review of the Maggotkin of Nurgle Battletome. 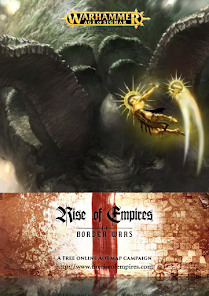 These are my views on the book from the lore through to painting and army build guides and into Path to Glory, Battleplans and finally the warscrolls themselves. 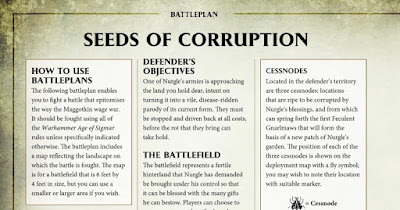 For a narrative player like myself, there is not much point in just focusing on narrative aspects, the whole book is filled from front to back with it, even building the strongest of Nurgle lists still lays down a huge narrative foundation to it. You will find yourself immersed in a world of rot and filth and you will love it! Throughout the book, it is filled with stunning artwork, from the front cover to the picture above of the Glottkin, each piece deserves a good proportion of time, just staring at it in awe. The best part about the artwork is just how vast and varied it is. 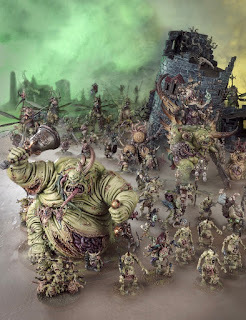 Some pieces like the Glott one conjure up dark and horrific scenes portraying Nurgle as pure daemons of nightmares. But, others portray them as happy, jovial creatures going about their work with joy. For the imagination, this does wonders, if you are looking for concepts for your army, the artwork is sure to provide. Even the army layouts like above give great inspiration and shows no matter what way you decide to build your army, it will look cohesive and fantastic on the board. 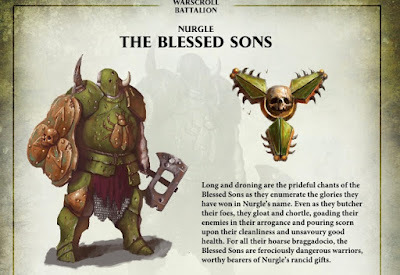 In the lore it solidifies exactly what we all knew about Nurgle's goals, they are here to extend the Grandfathers garden into the Mortal Realms, it explains more about the trials and tribulations of the Glottkin and the introduction of Rotigus too. 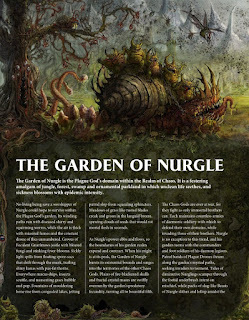 There is also more background given on Horticulous, my favourite part was learning just how angry the guy is to have been removed from the Gardens of Nurgle and forced into the Mortal Realms. For more and better detailed portrayals of Horticulous, I suggest you take a look at the Malign Portents website (http://www.malignportents.com). Here you will find an excellent short story on him, and of course.. BlightWar has some great reads in it too. 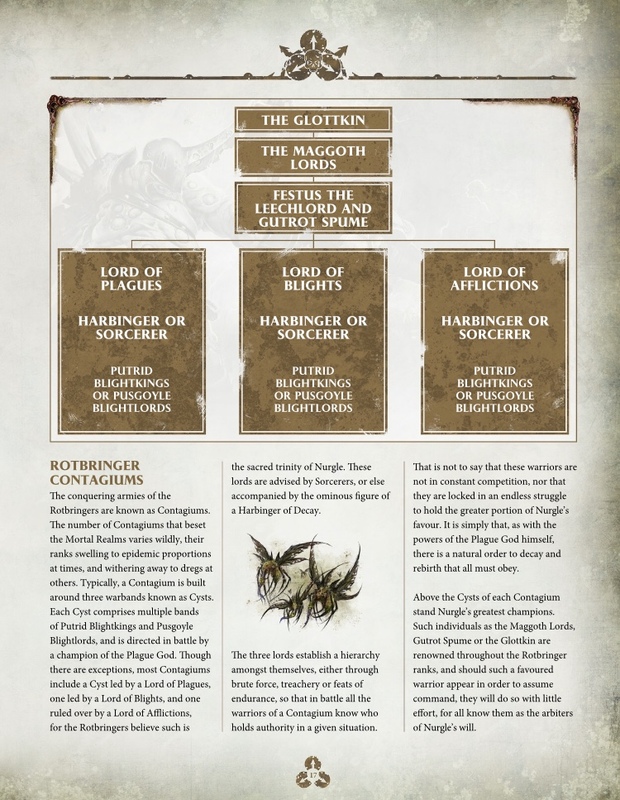 This section of the book is great for finding your concept of your army, you will find organisational charts showing who is higher in command, so if you field for instance a Maggoth Lord and Lord of Plagues, for narrative games you will know from this chart, the Maggoth Lord takes command. It also gives you a few warbands and daemon hordes already in existence, their symbols and colour schemes and their traits whilst on the battlefield. Although you may not get additional rules but will give you a mind-set of exactly how your army should be played if you follow one of these paths. If anything, I think this section should have been expanded more. One of my favourite parts of say the Stormcast book is just how many different colour schemes and tactics there are. This book lacks somewhat here. Always one of my favourite parts, the 'Eavy Metal section does not disappoint. 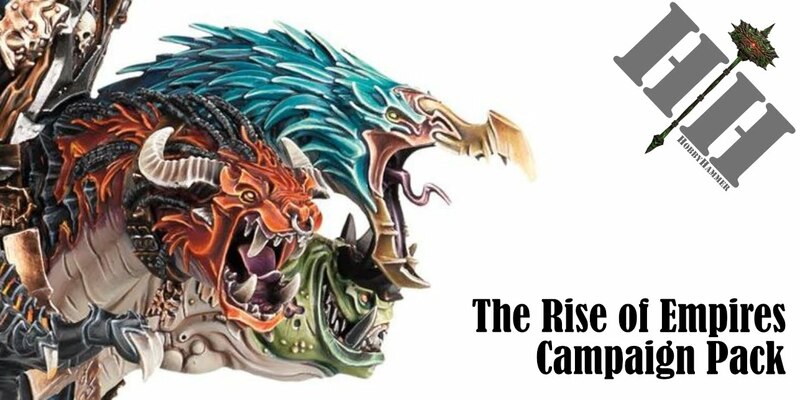 It does what it says on the tin, show you the best of what can be achieved with painting the minis and gives massive inspiration to painting your own. The paint guides are also good too, there is a 4 or 5 different guides to the most common areas. I would still say though, just visit Duncan and Chris on Warhammer TV for the best Nurgle painting guides out there. Onto everyone's favourite section, the abilities! Whether you are a narrative player or straight up Matched Play player, this is the section where you get to customise your army and include the most theme to creating your Maggotkin army and jeez do you get a lot of scope to do that. This is one of the first battletomes I have seen with hardly any auto includes for Matched Play and every option being viable for you. For the narrative side, you can really theme a hero or wizard with endless possibilities. I wont be going over them all here, if you want to read or listen about that, I suggest visiting Chris Tomlin on TGA or FaceHammer podcast. But what I will do is pick out my favourites and the ones I can see being adopted most frequently too. There are 3 main battle traits in which everyone gets regardless, the first is the Cycle of Corruption.. The Wheel, first introduced in BlightWar the boxset. If you want the physical wheel, you will need the boxgame, hopefully in the future Games Workshop will release this separately as it is such a key part to your army now. 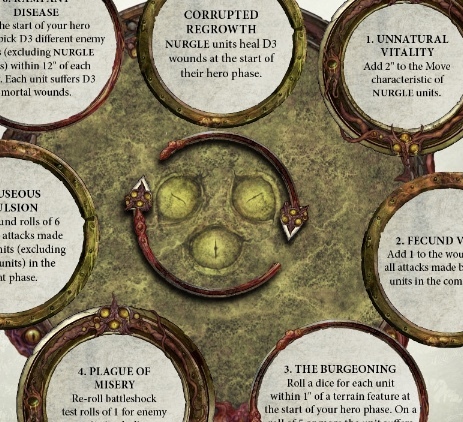 It has seven separate abilities that cycle round every battleround, you roll a D6 at the start to find the cycles starting point for that game, whether that gives you +2" to your movement or being able to deal out Mortal Wounds to enemy units, the next battleround the wheel will move to the next point. 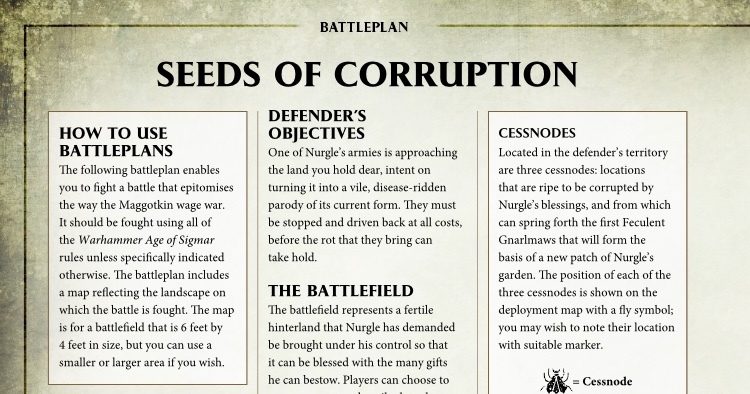 Straight away this gives a great vision of Nurgle and how their corruption works, a slow and steady cycle of decay and vigour. You will see as we go on, this can be manipulated and cunning Generals will be able to do so to great effect. The second ability is the Gnarlmaw, a new terrain piece that you are able to place (1 for free). The Gnarlmaw gives three abilities to you. Firstly it is a point of generating Contagion Points and also a portal for summoning Nurgle Daemons, it also allows Nurgle units to charge even if they ran and finally cause mortal wounds to non Nurgle units within range of it. The final ability is the Contagion points themselves. 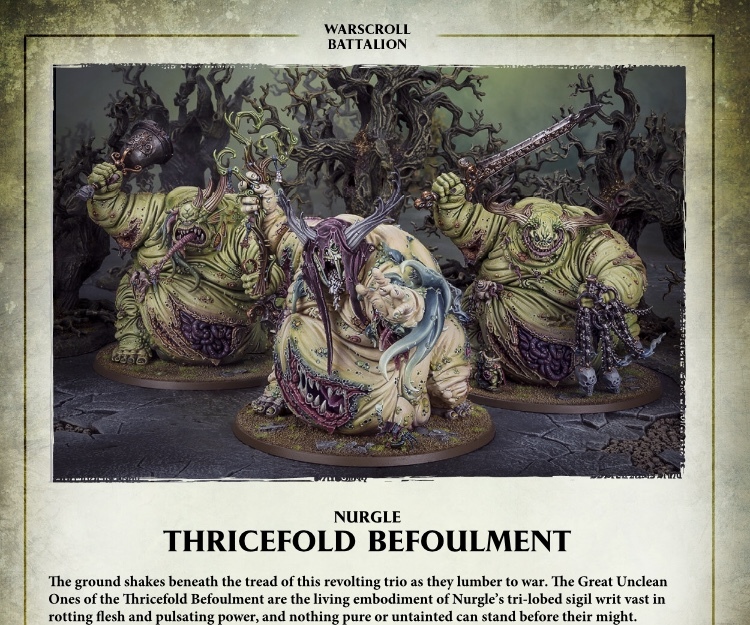 You build these up throughout the game and is the only way of being able to summon Nurgle Daemons to the battlefield. Each round you gain them for controlling your territory or being in the enemy territory and each Gnarlmaw generates D3 points too. (Note: some characters also give you contagion points too) When you have generated enough, you can them summon (still using Reinforcement points in Matched Play) daemons or... more Gnarlmaw (Free to summon). The board control you can get with these is crazy good now. In the book, there are 3 different sections, you get the Rotbringers (Blightkings, basically mortal heavyweights), Daemons and Mortal (Slaves to Darkness, but Rotbringers also have this keyword). All 3 share the first 3 command traits and the first is what you will probably see more. Grandfathers Blessing allows you to move the wheel a step forward or back once in the battle. The key here is the wording, At the START of the Hero phase. On the wheel, there is two abilities which really stand out and they are next to each other. Corrupted Regrowth allows every unit in your army to heal D3 wounds and Rampant Disease dishes out D3 Mortal Wounds to D3 different enemy units within 12" of each other. So as this ability happens at the start of the Hero phase, you can allow the wheel to move, do its thing and then move it back again to do its thing again. Each of the Rotbringers, Daemons and Mortals have 3 more each they can choose from too. For artefacts, in the Daemon section, the three stand outs for me are these. The witherstave making enemy units reroll hit rolls of a 6 is huge! Think of all them units in the game that do mortal wounds on 6's, the Tome can be equipped on say a GUO to add one to casting, this with the Bileblade on his warscroll is an instant 2+ to cast, this is good as a lot of the spells for Nurgle are quite high to get off. Endless Gift is an opponent demoraliser, again think of a GUO, your opponent does 9 wounds to him in a turn, then in the battleshock phase, you roll 9 (4+'s) and suddenly the GUO is back to full health, can really cause despair to them. 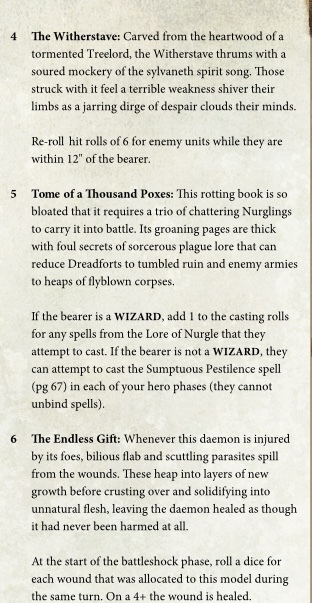 Another special mention for the more narrative out there is Nurgles Nail, basically it is an instakill item, roll a 7 on 2 dice and kill the enemy unit outright! For the Rotbringers, these two stand out for me. Muttergrub on a non wizard hero is great and allows them to cast the signature spell (Foul Regenisis). Or put it on a Wizard and gain the chance to cast another spell. Rustfang for me is one of the auto includes, -1 to save suddenly can mean that 1+ Stardrake or Treelord Ancient is actually killable! 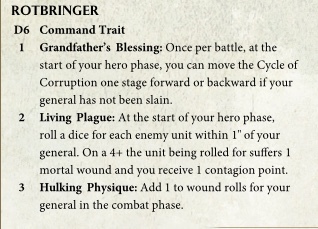 Combine this with Festus' Curse of the Leaper and a good roll on Gifts of Contagion below (another -1 save) and that really powerful scary unit with crumble with a stiff breeze. 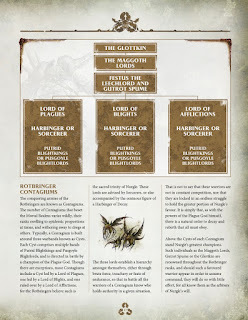 Onto the spells and the real power in the book, here is the reason you will want all them wizards on the table, can be equipped on named Characters (Glottkin, Bloab, Festus, Rotigus etc) and every option does something that can really effect a game. 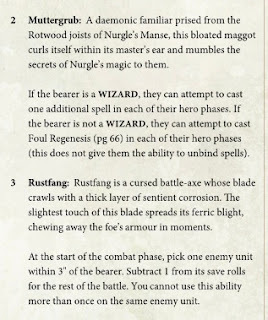 The spell every Nurgle wizard knows is Foul Regenisis, this allows you to move the wheel to any point of your choosing, which you will be doing a lot! Think of this combined with Grandfathers Blessing for some real wheel manipulation! Again of course I have my favourites, above, my two favourite (Blades being another auto for me). Blades cast on anything is amazing. 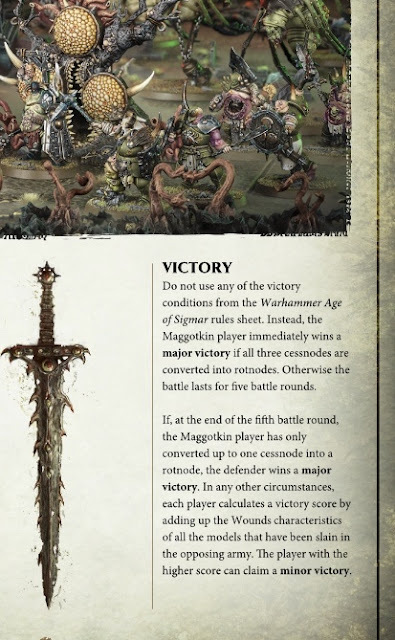 Turn them super resilient Plaguebearers in Bloodletter bombs (wheel on +2 move, well placed Gnarlmaw for Run and Charge and +3 from GUO bell and a GUO command ability +1 attack) or turn your Blightkings in Murder House (Blades + Glottkin Command ability for +1 attack, Fecund Vigour for +1 wound on wheel, BlightCyst for the -1 Rend) or even do damage from afar with Plaguedrones. For Daemons and Mortal, these stand out for me, Glorious Afflictions is well... glorious, if you play Triumph and Treachery, you will no how good the treacherous act of half movement and charge is... now Nurgle get it in regular games. That guaranteed enemy 3inch charge suddenly... not so guaranteed. Plague Squall is like a mini Stardrake ability. Not quite and good, but still board wide and mortal wounds dealt. The Path to Glory campaign has been updated slightly too to include new units and more customisable Heroes. 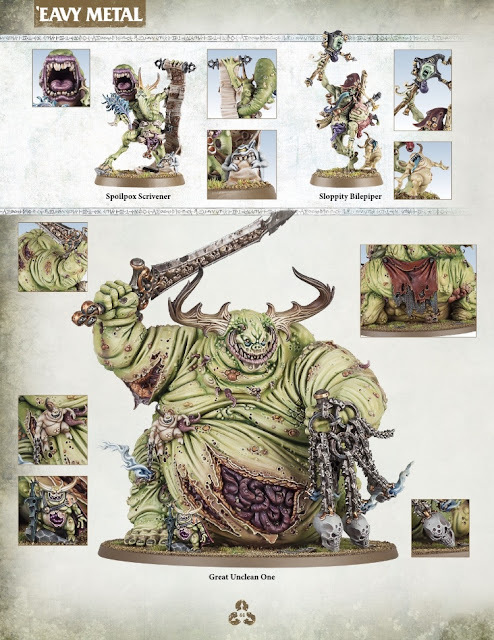 Looking forward to seeing this in action with the Nurgle players coming to Rise of Empires 2018. You only get one battleplan in this book, which is a little disappointing. I loved the old style Battletomes with 3 different missions which allowed you to play a kind of mini campaign with your army. 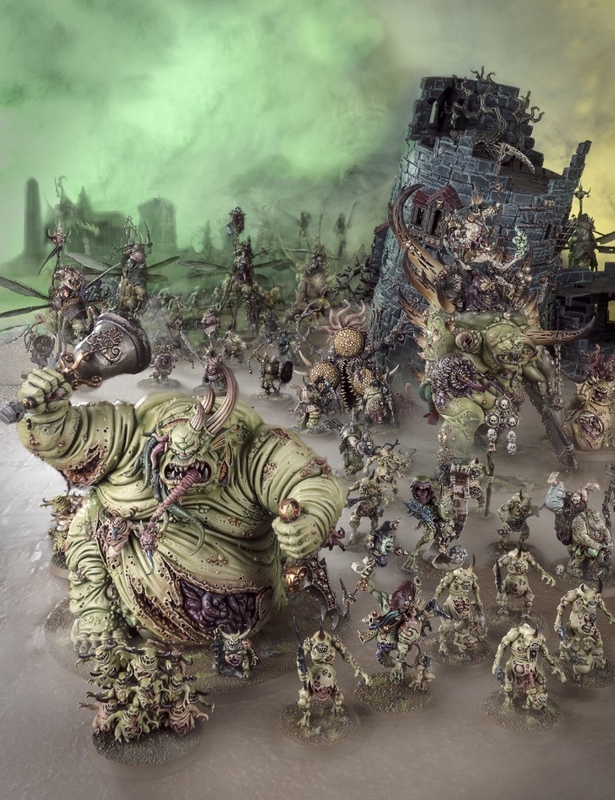 The battleplan you do get is good, it goes through the abilities of the Gnarlmaw nicely and gives you chance to see how fast Nurgle really are now as an attacking force. There are few warscroll battalions in the book, 2 BIG battalions for your mega battles, 3 Daemon and a few Rotbringer ones. With the exception of Thricefold, the 3 GUO battalion, and in hindsight, even this one too; all of them are geared towards Matched Play. The BIG battalions even in narrative play are just too big to really use. 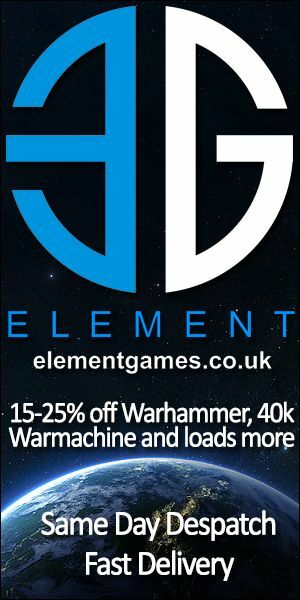 I have noticed a trend lately of there being less and less Narrative orientated Battalions, maybe this is with the lack of campaign books of late or a direction Games Workshop are going into more. For me, I wanna see more battalions based on the stories in the battletome and lore. 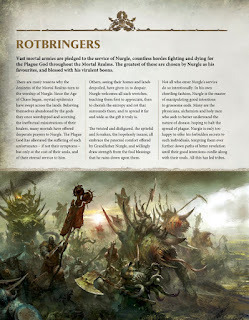 Give us a Rotbringer Pirate battalion led by Spume, or a Knightly Order of Flies battalion with Chaos Knights, Rotbringers and Marauders etc. I don't see why, except for the fact of space in the book, these aren't being thought of anymore. If it is a case of you don't want to see these in Matched Play, just don't give them points, but either way, I think this is the only real lacking element in the book. There is 2 battalions in Matched Play I can see myself using more than the others and below is my lists based on these. The first is not even in this book but instead from the Everchosen Book. 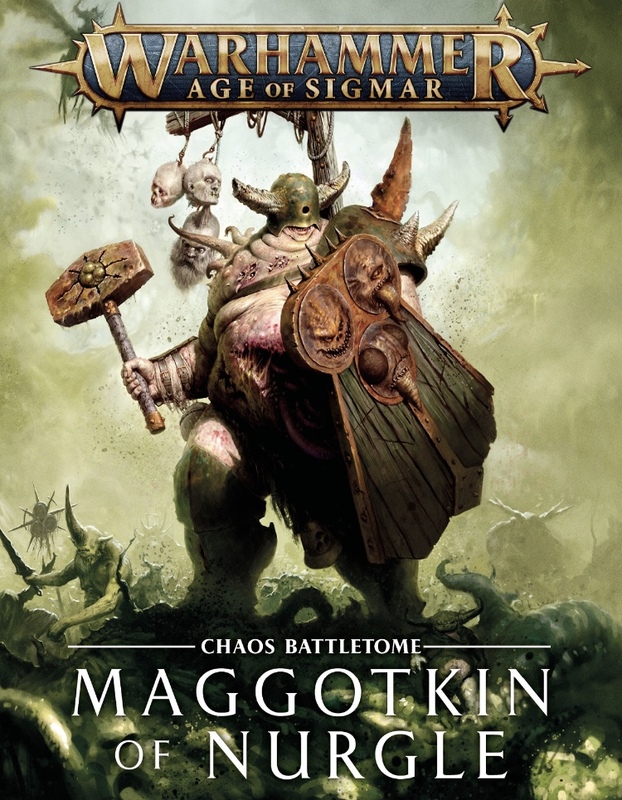 I have been running and refining Plaguetouched Warband for a while now and with this book see's the banishment of Glottkin and entry of a GUO. 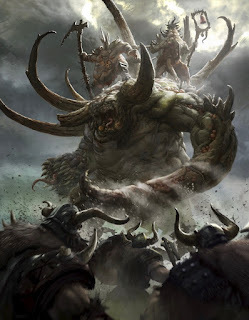 The battalions gives an army wide -1 to hit against them in the Combat phase and also an ability where if you field your units in multiples of 7 (14 blightkings, 28 Marauders... etc) then every time the enemy rolls a wound roll of 6 in the combat phase, they suffer a mortal wound in return. 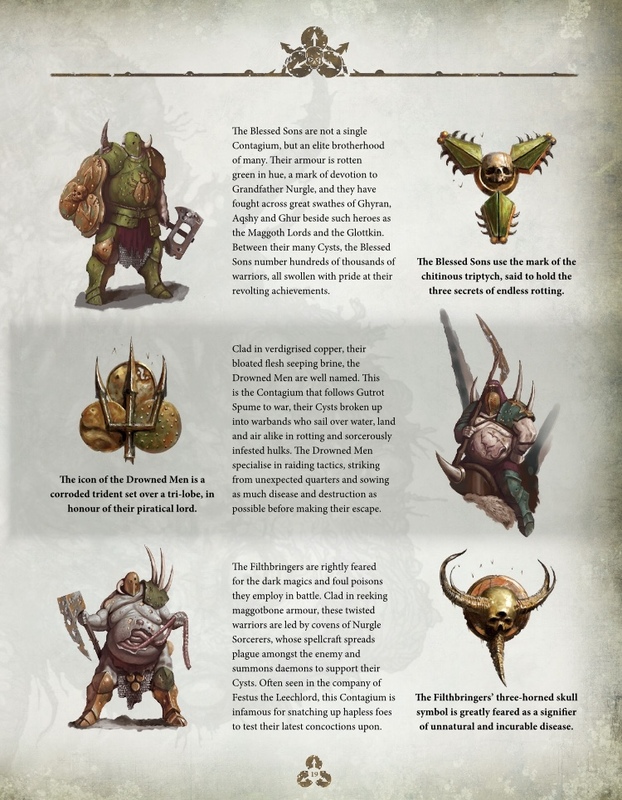 The idea of this list is to keep things close to the Harbinger and hold the line, sending the Blightkings out at the right time and using the spells to cause damage. 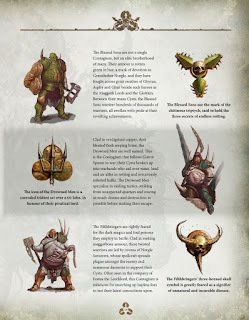 The second option for me is the BlightCyst, who can deny -1 rending Blightkings with like I mentioned above a complete Murderhouse combination on them. Also making the GUO the General and having the Plaguebearers gives option for a "Plaguebomb"™. So, that's it! I will leave the rest for you when you decide you will be buying this book. Overal, it is fantastic, great stories, artwork and abilities. I hope you enjoyed this! I certainly did writing it and it is good to be back writing some blogs. Will see you soon for something extremely special.